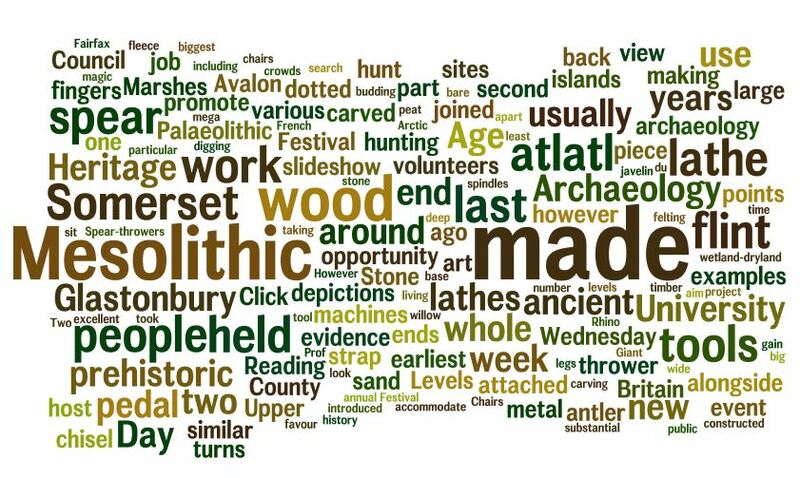 The last fortnight marked the Council for British Archaeology’s annual Festival of Archaeology! Two weeks of festivities celebrating the heritage of Britain and an opportunity to promote archaeology to a wide public audience. The second week of this event coincided with the Avalon Marshes Landscape Partnership’s Wetland Festival. A perfect companion, with an aim to promote the history, culture, nature and people of the Somerset Levels. As mentioned in a previous post, the whole of the first week and the Tuesday of the second, was spent a’furtling on the various sand islands dotted around the levels looking for Mesolithic microliths. Wednesday however, we headed to St. Dunstan’s School in Glastonbury and brought the Mesolithic to life through our Stone Age Day! An immersing event packed with spear throwing, archery, flint knapping, woodworking, pot making, shelter building and a taste of hunter-gatherer foods. Thursday was the Volunteer Taster Day, an opportunity for budding new Hands on Heritage Volunteers to gain an insight into what we get up to and get involved. Drawing down on the shave horses. Alongside this, kids were spoiled by the telling of the mighty tale of the Polden Pig, courtesy of local artist Michael Fairfax and the County Archaeologist, Bob Croft. Captivated kids begin creating their own clay battle pigs. Sunday finished the tirade of events with a hands-on showcase of Traditional Wetland Crafts. This full day saw a whole host of ancient technologies being displayed and loads of opportunities to have-a-go. Master-basketmaker Ivor was present demonstrating his unrivalled skill with willow, bodger and woodturner Richard Devaney was carving, chopping and chiselling sticks into all kinds of wonderful stuff, Alison and Tony were making string, weaving wool and spinning fleece, alongside Amy teaching the crowds the magic of felting. We were also joined by Tanya, our new Community Heritage Officer who was on hand, sharing the art of archaeology alongside Kevin on the gate, meeting, greeting and bashing out iron age coins. PHEW! I think its time for a well earned break….